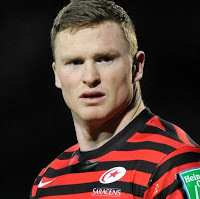 Apparently Chris Ashton's decision not to tour South Africa with England Saxons next month is not a question of the Sarries winger throwing his toys out of the pram having been left out of the senior squad to play Australia. Ashton's wife is due to give birth towards the end of June and so, according to Sarries Head Coach Mark McCall, his head "wouldn’t have been in the right place." And yet his head would have been "in the right place" had he been selected to go to Australia. Go figure.